Hello hello hello! Apologies once again for my lack of blog posts and general social media presence. It has been rather crazy lately and I haven't had much of a chance to do nails at all. All my nail art stuff is still in bags/boxes from when I moved house! 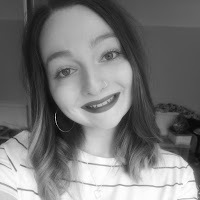 I really want to continue blogging so hopefully this will be the start of getting back into it. 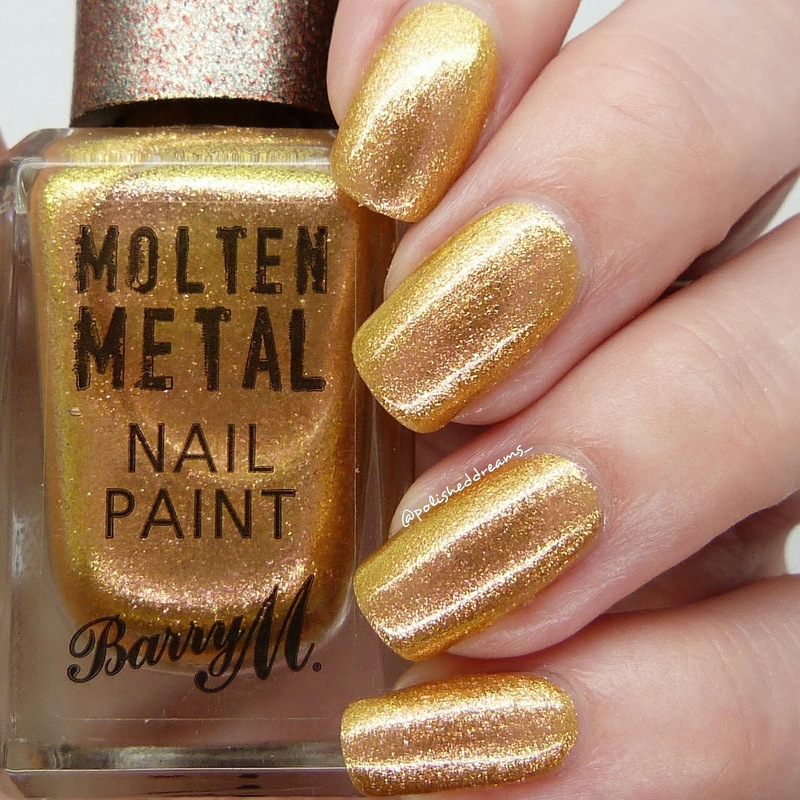 Today I have some rather overdue swatches from Barry M to share! Last summer Barry M released the Molten Metals (if you want a laugh you can see my old swatches of those here), four polishes with a metallic finish and a whole year later they have finally added to that collection! There are five new Molten Metals in total, however, I only picked up two of the four for a few reasons. 1. I'm a poor student, 2. I have very similar polishes to the black and blue additions, 3. The pinky/rose gold is a re-release of the Superdrug Limited Edition polish 'Twinkle Twinkle'. I personally think it's a bit cheeky of them to release the same polish, especially when it was supposed to be a limited edition shade but hey, they've done it. Anyway, let's take a look at the swatches for the two I did buy shall we? 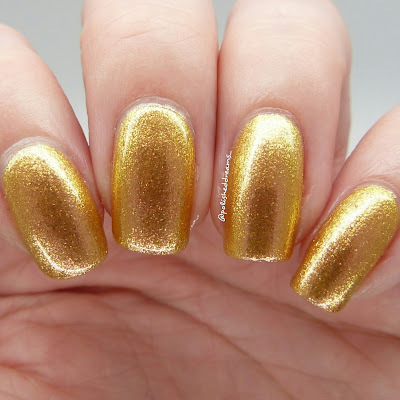 The first I'm going to show you is 'Gold Rush', a lovely bright yellow gold with a slight pink shift and shimmer. The formula was thinner than I think I'm used to but still very manageable. It was also a little sheer so required a few coats for it to be totally opaque. I didn't mind doing an extra coat as it dried nice and quickly and it's really pretty! 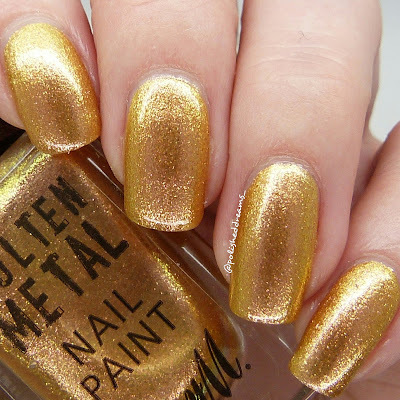 I actually didn't expect to like this as much as I did as I find golds on me to be very hit or miss but this is definitely a big hit! Swatches shows three coats with topcoat. 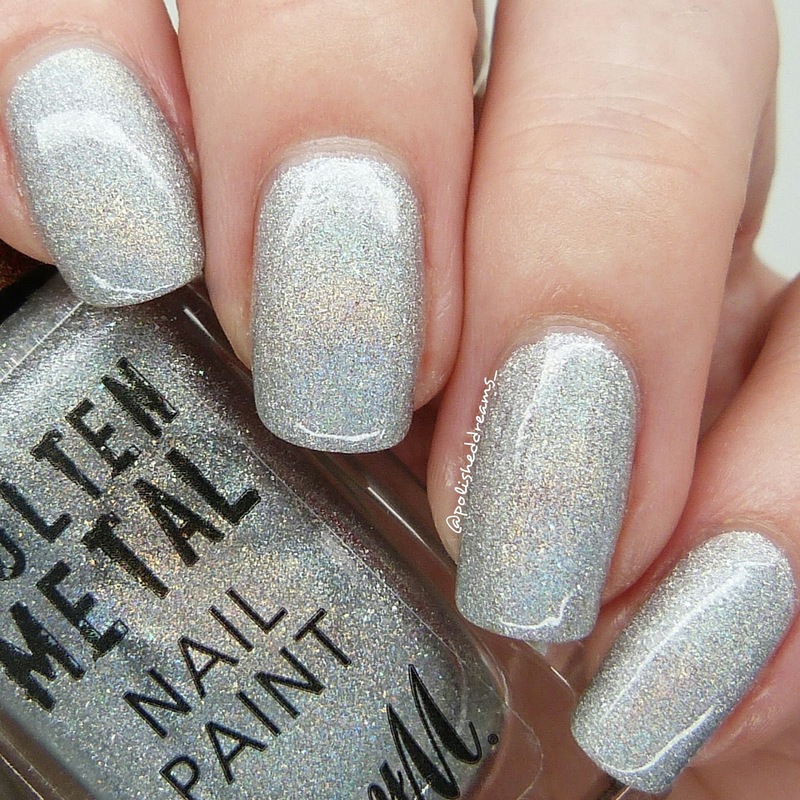 Of course the other polish I bought had to be the holographic one that people were getting very excited about. 'Holographic Lights' is a fab bright silver holo and although I have a couple of silver indie holos, I just had to get this. When this was released Barry M was the only mainstream brand with a holo polish but now a couple of others have released some too. Looks like they're finally catching up with the indie world! As with the previous polish this was also quite sheer and streaky in parts but the formula was great. Shown here is three coats with topcoat. So what do you think? I really like both of those and will hopefully be using them again soon. Just need to finish getting through my mountain of untrieds that's built up over the past couple of months whilst I've been busy! 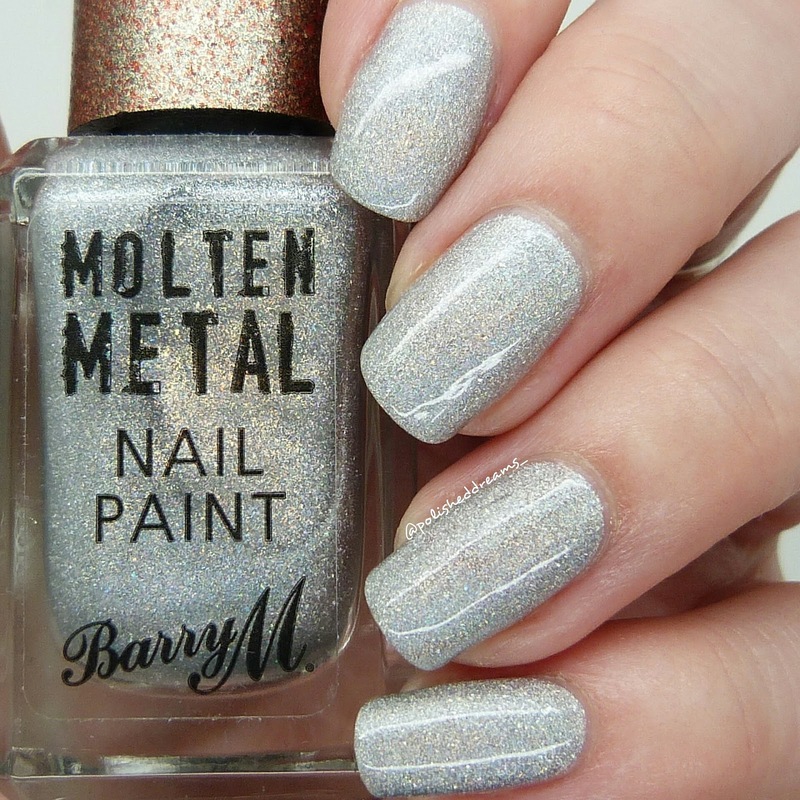 It's great to see mainstream brands doing something different and I really hope Barry M continues with experimenting. 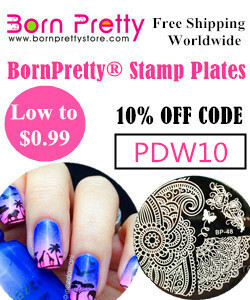 I love a lot of their products, not just their polish, so they really are a favourite! My only hope is that they stop re-releasing popular shades with new names, it's not fair and it's not creative. I will however accept them adding their LE lip kits to permanent stock because I want them! And also it's under the same name sooo. 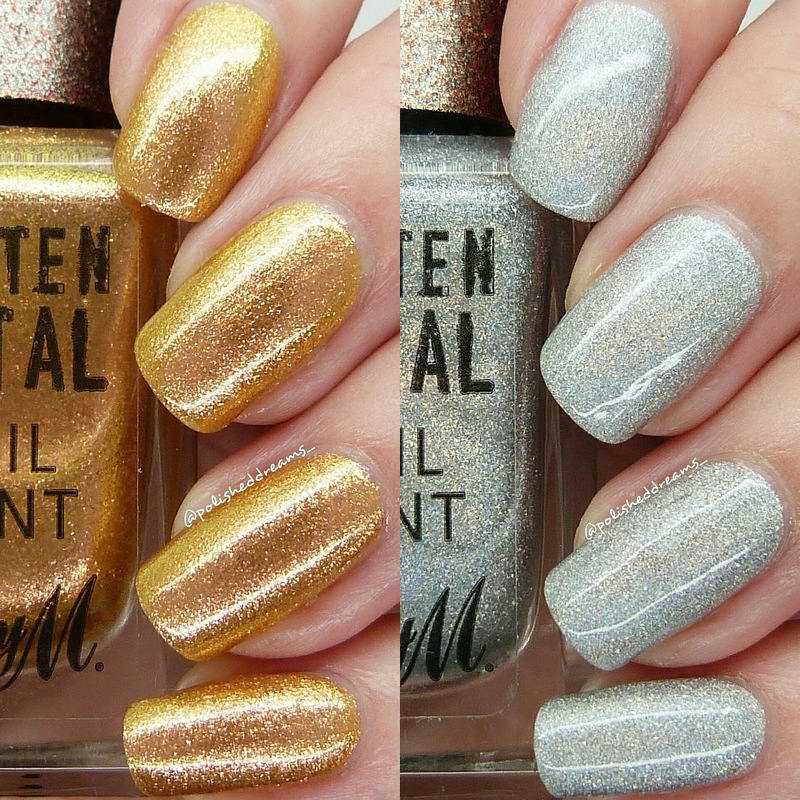 Anyway, thank you Barry M for more beautiful polishes, I can't wait to see what comes out next! Both polishes (and the others in the collection) are available at Boots, Superdrug and on the Barry M website for a great price of £3.99. Boots also currently have an offer both online and instore for a free mermaid make up bag when you spend £7 on Barry M! I like both of them, but the silver one... I felt in love with it! I can definitely see why, it's beautiful!